The Neil Gehrels Swift Gamma-ray Burst Hunter was launched on November 20th, 2004. Since that time, Swift has been working tirelessly, carrying out its prime science mission to find Gamma-ray bursts with its Burst Alert Telescope (BAT), and studying the X-ray and UV afterglows of these titanic explosions with its narrow-field imagers, the X-ray Telescope (XRT) and the Ultraviolet/Optical Telescope (UVOT). In between finding and studying Gamma-ray bursts, Swift also makes many key observations of other cosmic sources, like accreting black hole binary systems, neutron stars and white dwarfs, near-normal stars, and normal and active galaxies. Swift has achieved many milestones over its 14-year career. One notable milestone was passed on May 13, 2018, when the UVOT obtained its one millionth image, a picture of an active galaxy known by the rather unwieldy monniker 2MASX J16110570+0234002. 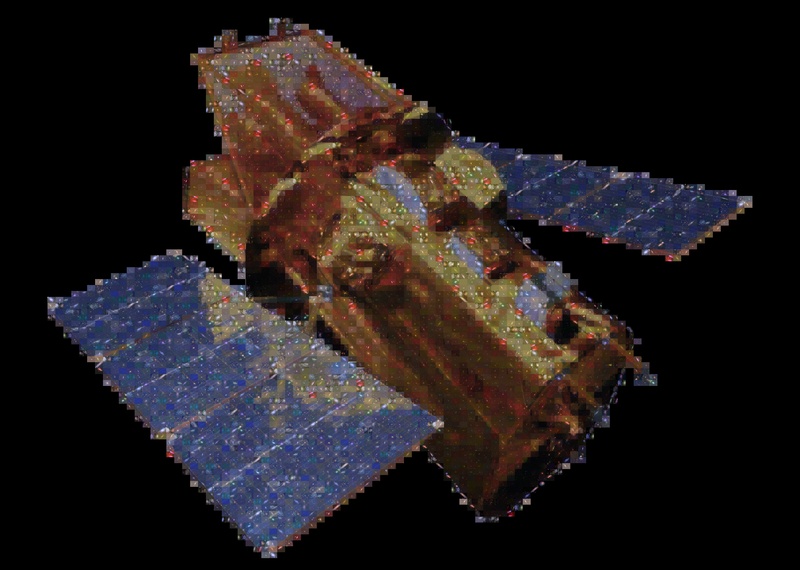 In honor of this important achievement, NASA and the Swift project created a mosaic of the Swift spacecraft entirely out of UVOT images. Make sure you view the higher-resolution mosaic, and see if you can find the surprising UV afterglow from the neutron star merger which produced the gravitational wave event seen in August, 2017.